Free Download IBPS CWE Clerk VII Old Question Papers Pdf. The candidates preparing for the IBPS Clerk Exam can download IBPS Clerk Previous Year Question Paper for free of cost. We have provided the Institute of Banking Personnel Selection (IBPS) Clerk Exam Model Papers. Download the IBPS Clerk Past Ten Years Papers along with the Solutions. All the applied candidates can have a look at the IBPS Clerk Exam Pattern. Also, check the IBPS official website i.e. www.ibps.in to know more details about the IBPS Clerk 2017 Exam. Find the IBPS Clerk Previous Papers downloading links. Applicants can download the Institute of Banking Personnel Selection Clerk Exam Model Question Papers. Start your preparation with the help of downloaded IBPS Clerk Prelims Previous Year Question Paper. So that, you will get complete idea about the previous years IBPS Exam Analysis, Difficulty levels. 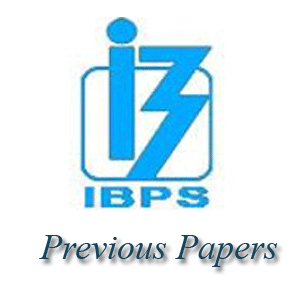 Free downloading links of IBPS Previous Papers are enclosed below. Get these IBPS Clerk Previous Year Question Paper within few seconds by clicking on required link. There is a huge competition for the Bank Jobs Nowadays. So, the applicants who have the perfect plan, as well as preparation only, have chances to get the Dream IBPS Job. Aspirants who want to get this IBPS Clerk Job are suggested to work hard and prepare well with the proper schedule. First of all, make a section wise preparation plan and collect all necessary materials before initiation of preparation. For that purpose, here we have provided the Free downloading links of IBPS Clerk CWE Prelims Model Question Papers. Post Name IBPS Clerk Post. No. of Vacancies More No. of Vacancies. Exam Name IBPS Clerk Exam 2017. The IBPS Clerk CWE VII Exam is of Multiple Choice Type. And, all the candidates appeared for the IBPS Clerk Exam, need to write the Exam in Online Mode. There are three sections in the IBPS Clerk Prelims Exam. The IBPS Clerk Exam consists of the common topics like General English, Quantitative Aptitude, and Reasoning Ability. General English consists of 30 Questions. So, the marks are 30 Marks. Quantitative Aptitude consists of 35 Questions and marks are 35 Marks. And, the Reasoning is for 35 Marks and consists of 35 Questions. The IBPS Prelims Exam is for 100 Marks. And, the duration of time is 1 Hour. The IBPS Clerk Exam consists of both Prelims and Mains. And, the qualified candidates in the IBPS Clerk Prelims Exam will attend the Mains Exam. And, the IBPS Clerk Mains Exam is also of Objective Type. IBPS Clerk Mains Exam comprises of 200 Questions. There will be negative marking for the IBPS Clerk Exam. The total duration of time for the IBPS Clerk Mains Exam is 2 Hours. On this section, we have uploaded the Last 10 Years IBPS Clerk Exam Solved Papers. The IBPS Clerk Exam Sample Papers are available in Pdf format. And, the IBPS Clerk Previous Year Question Paper available for free of cost. So, all the candidates preparing for the Bank Exams can download the IBPS Clerk Previous Year Question Paper to get good marks in the Exam. By solving the Previous Question Papers, candidates will know the complexity of the Exam. The candidates can know the topics in which they are poor. So that, the aspirants can do more hard work for the IBPS Clerk Exam. Download IBPS Clerk Previous Papers from this article. Hence, all the candidates can download the IBPS Clerk Previous Papers to crack the IBPS Clerk Online Written Exam. And, there is no interview for the IBPS Clerk Posts. All the applicants of the IBPS Clerk Recruitment are selected only through the Written Exam. So, the candidates must write the IBPS Clerk Written Test well to get the Clerk Job. And, there is negative marking for the IBPS Clerk CWE VII Exam. So, a penalty of 0.25 marks will be deducted. Hence, all the candidates are suggested to write the IBPS Clerk Exam carefully. The candidates who have doubts regarding theáInstitute of Banking Personnel Selection Clerk Exam & IBPS Clerk Previous Year Question Paper can visit the official website of IBPS i.e. www.ibps.in.